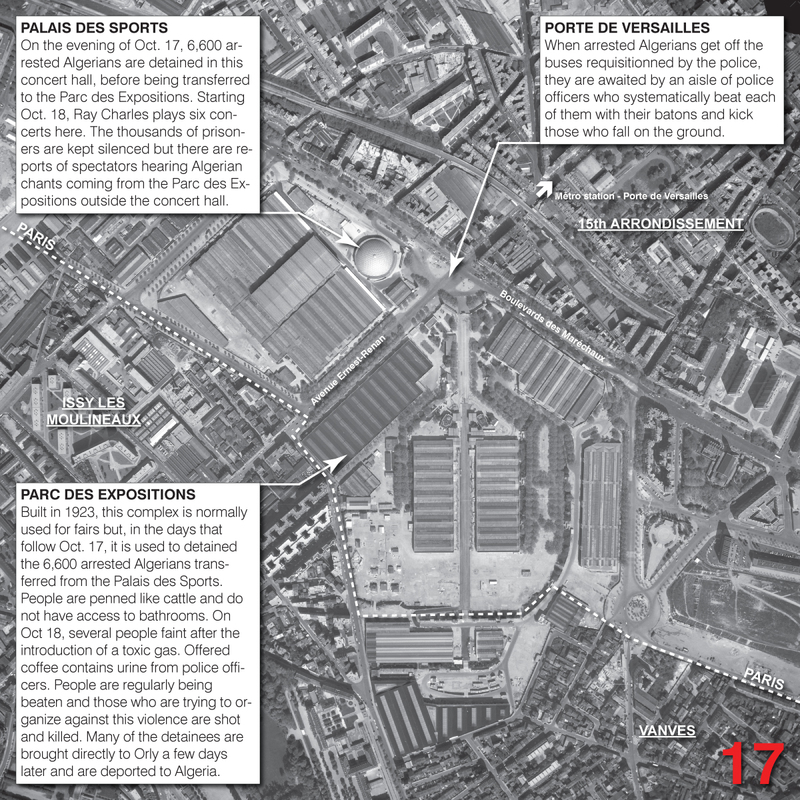 In my current research about the architecture of the five states of emergency declared by the French State since 1955, the October 17, 1961 massacre that occurred in Paris towards the end of the Algerian Revolution is a key event. One thing is striking in the (disproportionally small) memorialization that is made of this event every year: the supposed spatial and temporal punctuality of its occurrence. 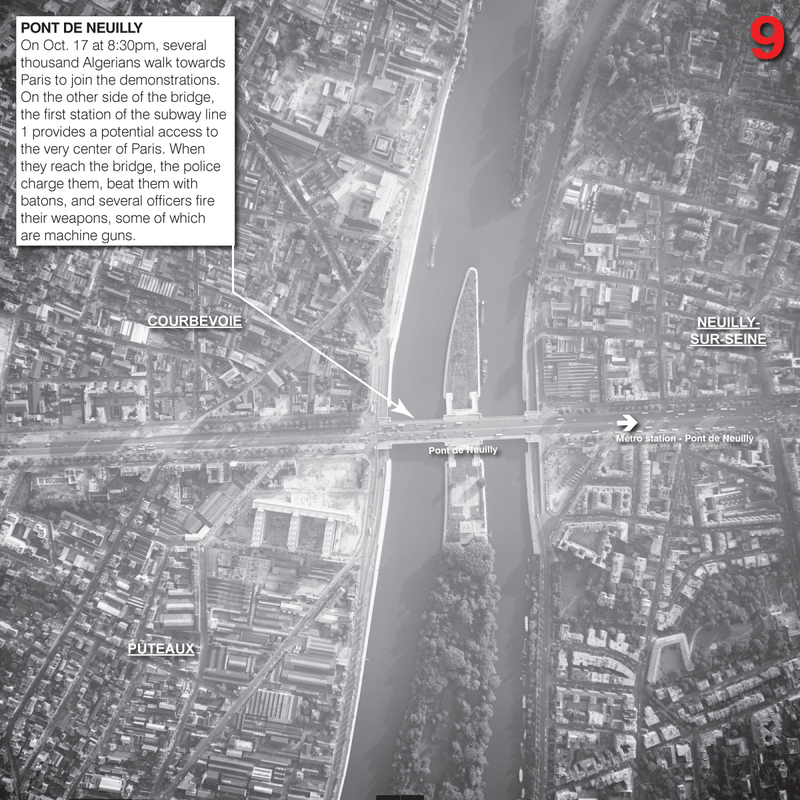 According to the main narrative, the extremely violent scenes of French police officers throwing Algerians into the Seine River happened around the Place Saint-Michel at the very center of Paris and manifested itself in the “hot-blooded” moment of suppression of massive demonstrations. What further research reveals, on the contrary, is that this massacre occurred in a multiplicity of spatialities and temporalities. 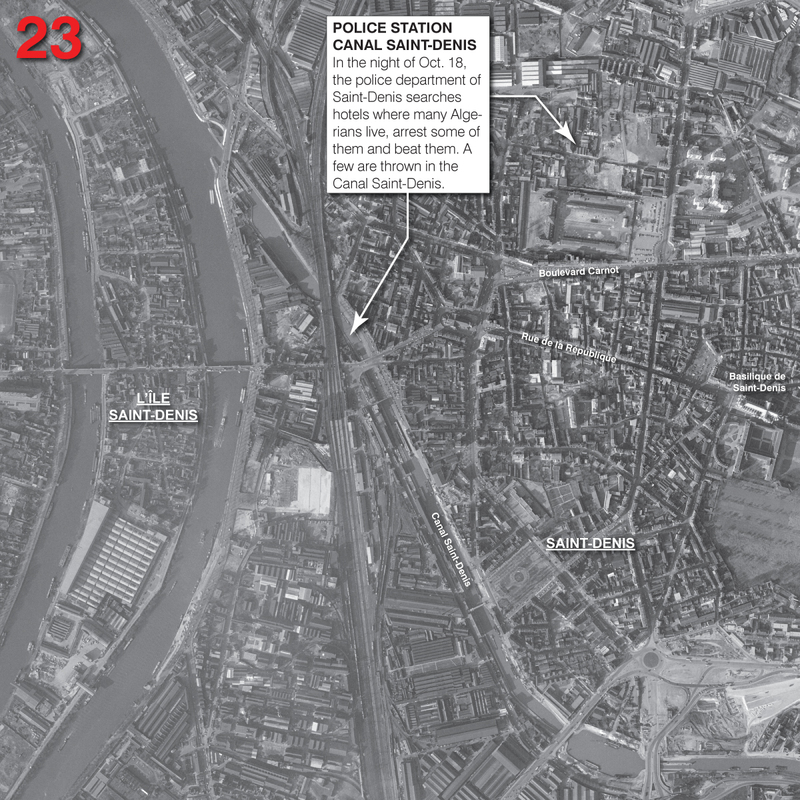 This is what this series of maps using aerial imagery from the time (plus/minus 3 years) attempts to illustrate in its descriptions of this event in a similar fashion to the one I drew in 2014 to address the relationship between the city’s physicality and the bloody annihilation of the Paris Commune in 1871. 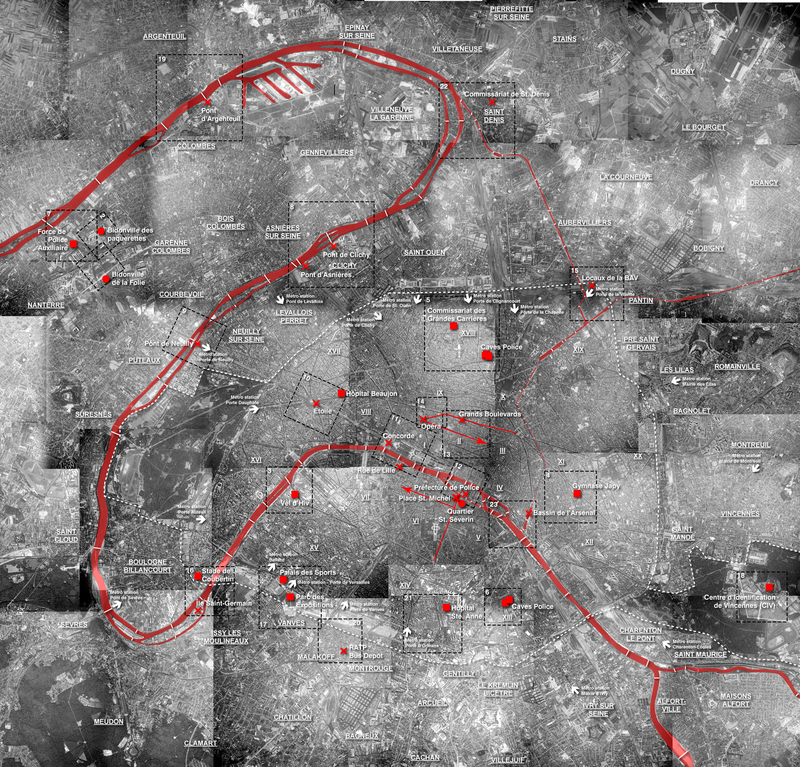 (see these maps here). Map by Léopold Lambert for The Funambulist (2017). 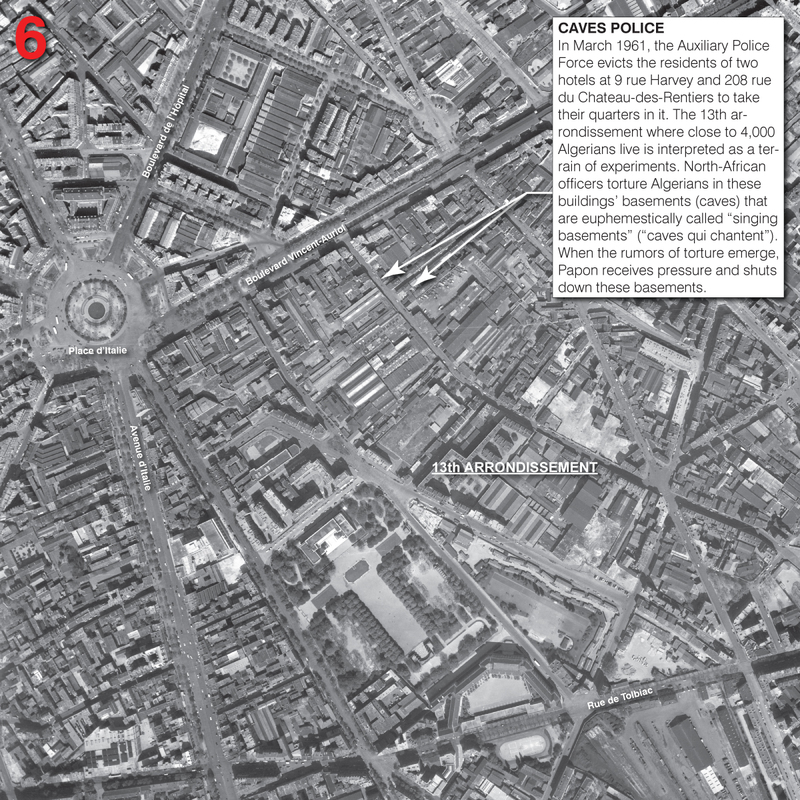 Numbers on each dashed square are keys to the series of maps presented below. In order to understand this event, some historical context is necessary: in 1961, the revolution led by the Front de Libération Nationale (FLN) that aimed at decolonizing Algeria was seven years old. Initiated in Algiers’ Casbah, the decolonial movement spread to the rest of Algeria, as well as into large French cities, where an important amount of Algerians lived (350,000 in 1962). Although several administrative institutions dedicated specifically to North Africans residing and working in France had been created by this time by the French State — see Policing Paris: The Origins of Modern Immigration Control Between the Wars by Clifford Rosenberg (Cornell, 2006) for an account of the 1920s and 1930s in particular — Algerians in France were not administratively considered colonial subjects, and were virtually entitled to the same rights as any other French citizen, Algeria being considered a part of France. In reality, the job and housing segregation was manifest, and the police, in particular those of Paris, practiced racial profiling on a daily basis. The Brigade des Nord-Africains (BNA) that explicitly targeted North Africans and had provided auxiliary officers to the Gestapo during the occupation (1940-1944) was dissolved in 1945, but in 1953, a new branch of the Paris police was created to operate according to the same logic: the Brigade des Agressions et Violences (BAV). Racial profiling as a colonial and counter-insurrection tactic was never made more explicit than when on October 5, 1961, a curfew solely implemented on Algerians was declared by the Seine (Paris metropolitan area) Prefecture of Police. 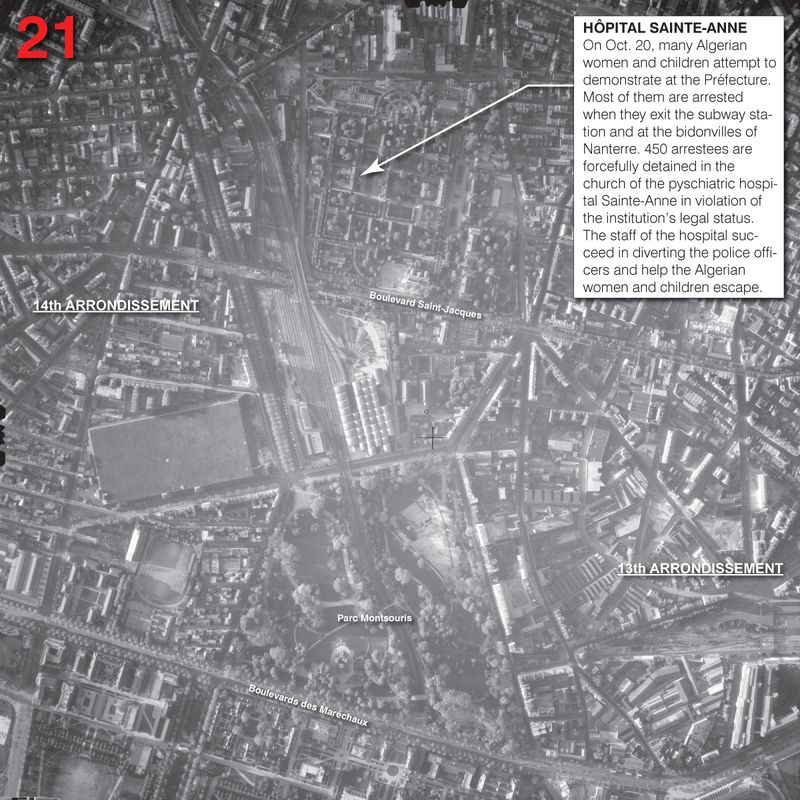 – 1945: Charged with the vice-direction of Algeria at the Ministry of the Interior. – 1946: Takes part in the Interministry Commission on the French West Indies. – 1949: Is named Prefect of Constantine (Algeria) for the first time. 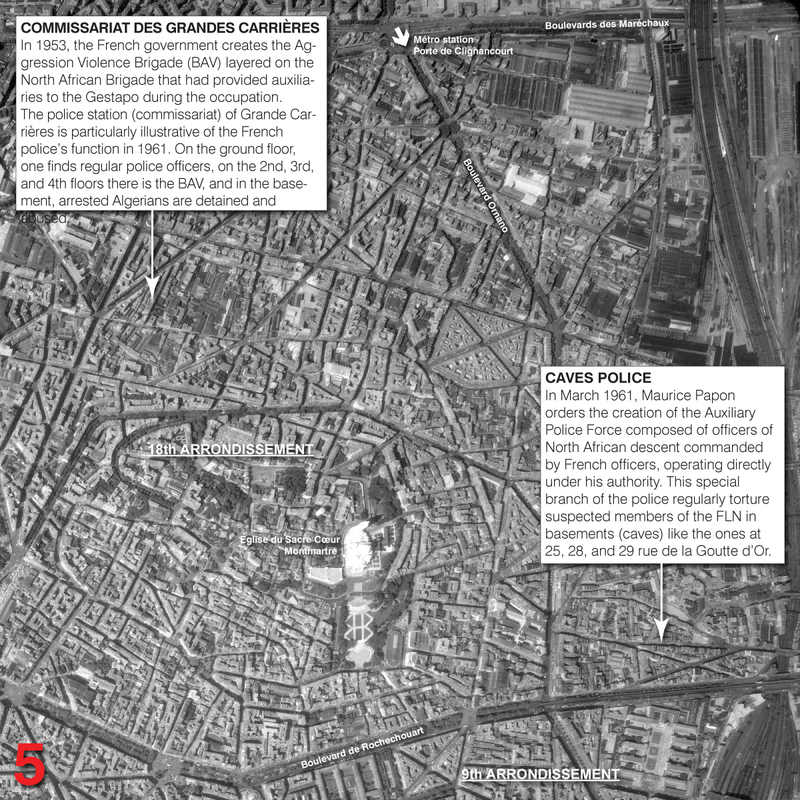 – 1951: Occupies the position of General Secretary of the Paris Prefecture of Police. – 1954: Is named General Secretary of the Morocco Protectorate. – 1956: Returns to Constantine as IGAME (Prefect with extraordinary powers) to lead the counter-insurrection against decolonial movements in the Northeastern part of Algeria. 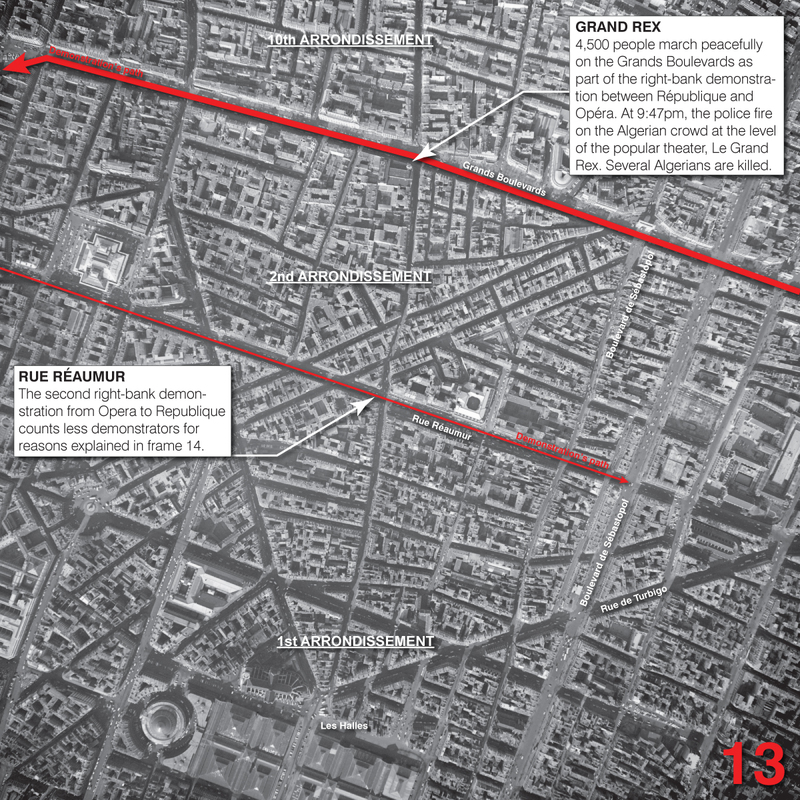 In 1956 and 1957, records attest to the killing of 18,316 so-called “rebels” by the French colonial police and army, as well as 117,000 people “regrouped” into camps — see Fabien Sacriste’s text about these camps in the Aurès in The Funambulist 10 Architecture and Colonialism. 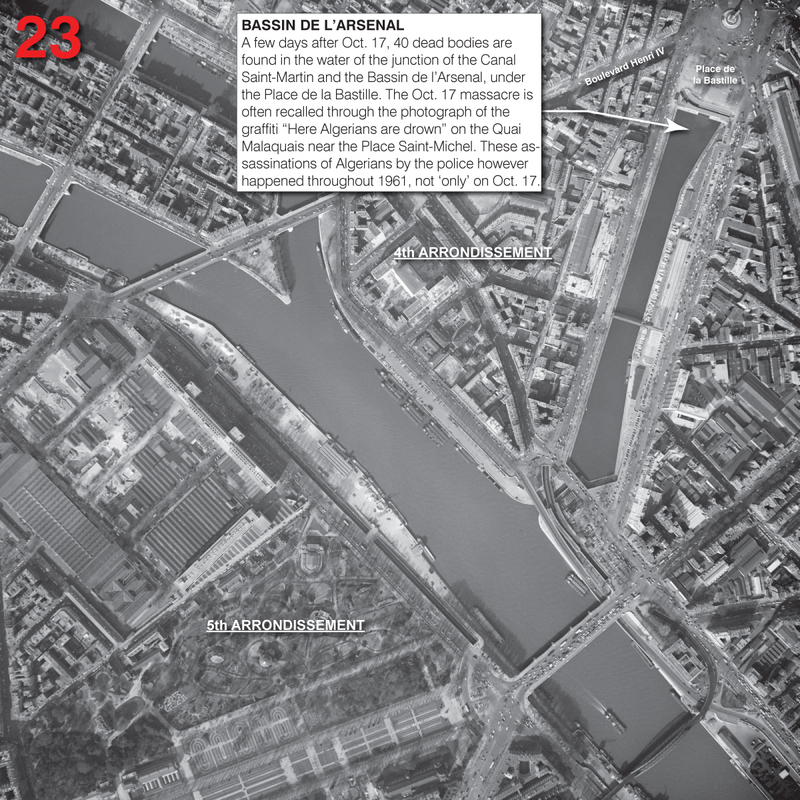 In 1958, the FLN in Paris was particularly active in its clandestine political organizing, raising and transferring funds — with the help of French “suitcase carriers”— also regularly carrying out assassinations of its opponents, Algerians they considered as “traitors,” and French police officers. On March 13, 1958, police officers demonstrated in front of the French Parliament to demand more latitude and immunity in their job; the next day, Papon was named Prefect of the Seine and was charged with annihilating the presence of the FLN in the Paris metropolitan area, strengthened by his training in counter-insurrectional tactics and practices from his experience cited above. 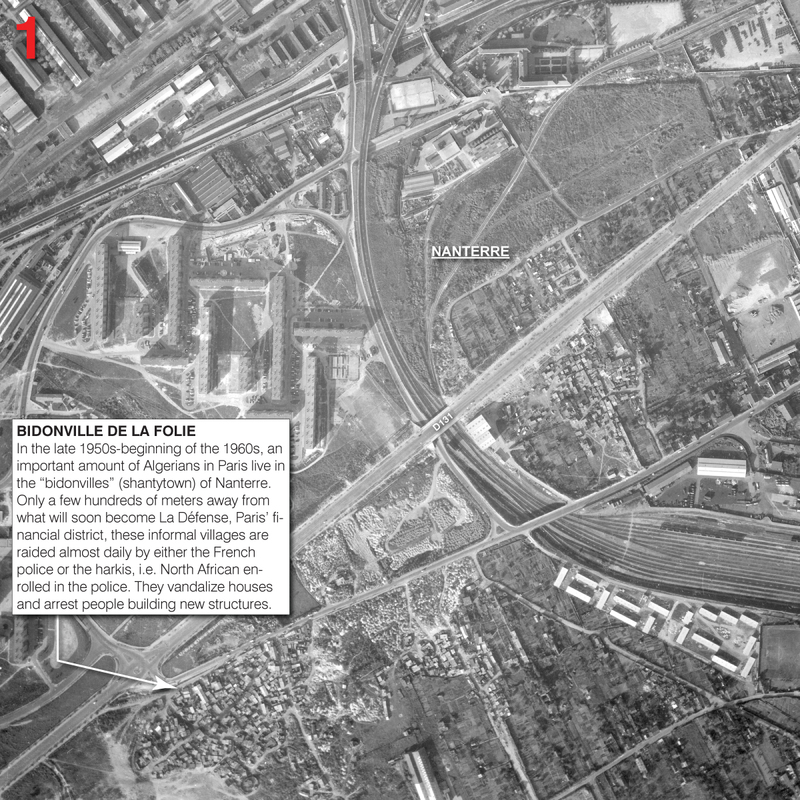 As shown on maps 3 and 4 below, on August 28, 1958, Papon organized massive roundups of Algerians, detaining 5,000, including at the infamous indoor velodrome, the “Vel d’Hiv,” where on July 17, 1942, 12,884 Jews had been rounded up before being deported to Auschwitz. In January 1959, Papon created the Centre d’Identification de Vincennes (CIV) where Algerians could be legally “assigned to residence” [sic] without trial (see map 18 below). In March 1961, he created a new branch of police under his direct orders: the Force de Police Auxiliaire, composed of harkis (Algerian volunteers in the French police and army in France and Algeria). 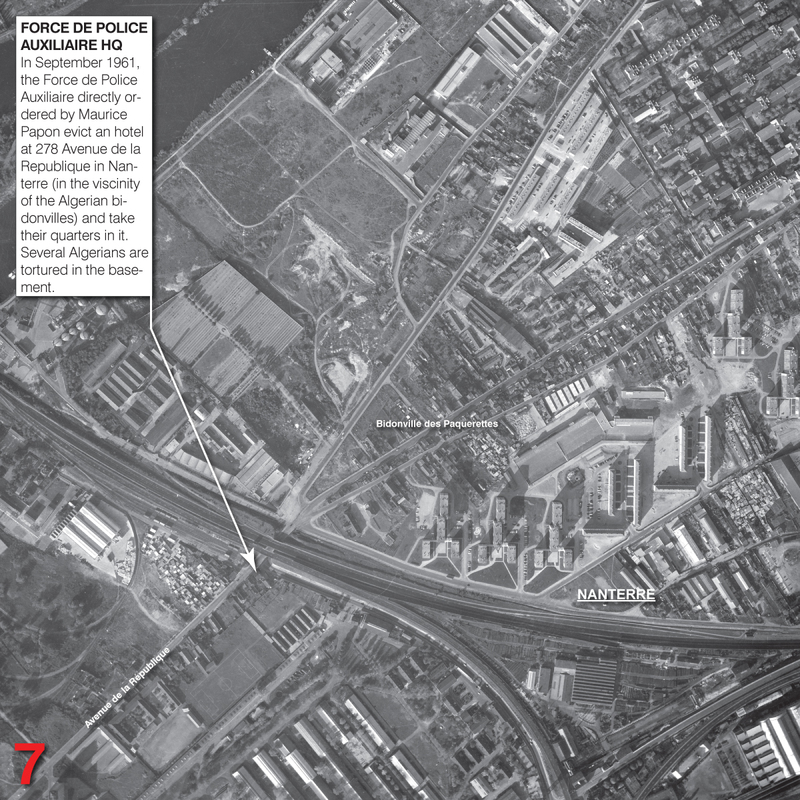 These officers were given the biggest latitude in their suppression of the FLN, and any Algerians suspected of having ties with the decolonial organization — and given that the FLN was intimidating recalcitrant Algerians into paying the revolutionary tax, this means almost all Algerians — were arbitrarily arrested and tortured in police stations and nearby basements (see maps 5, 6, and 7 below). 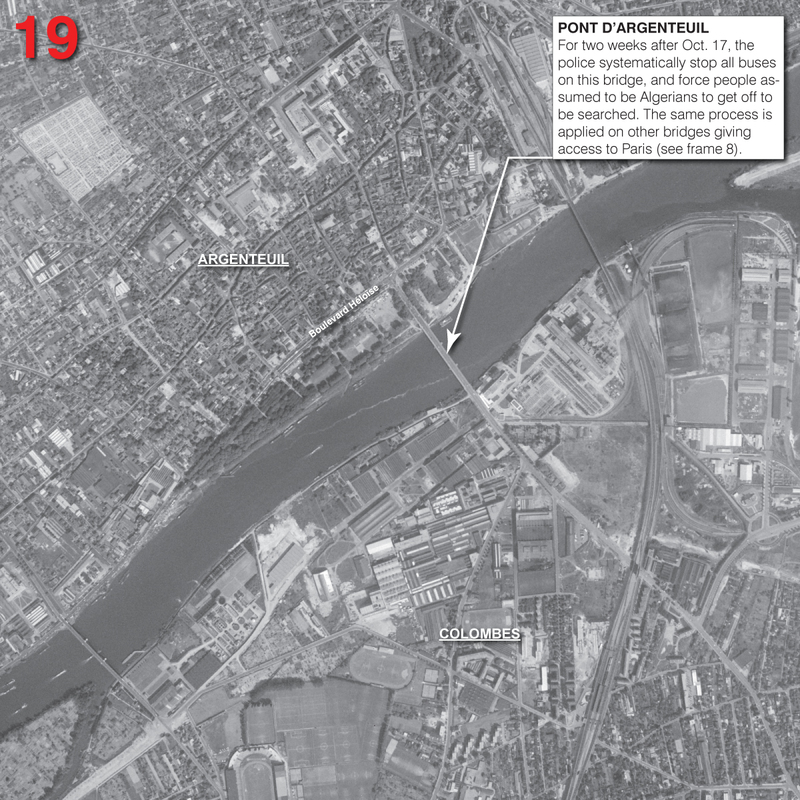 Some of those tortured were later thrown into the Seine, months before the October 17, 1961 massacre, now associated with this atrocious practice. 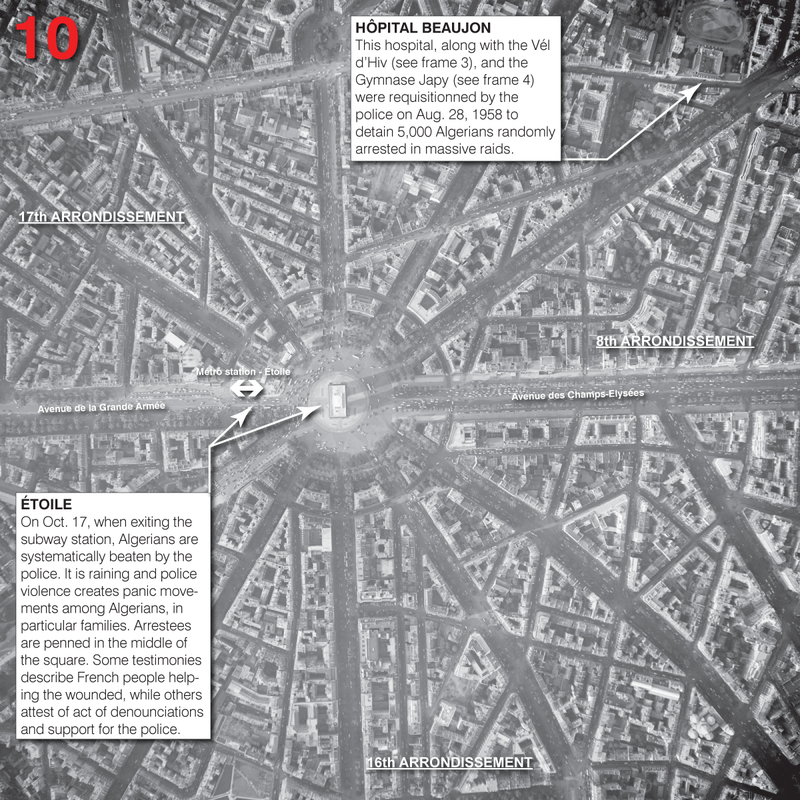 Although the references I have been using for this article (see below) are quite precise and comprehensive in the descriptions of the October 17, 1961 massacre and its historical context, they surprisingly fail to indicate an important contextual element: on April 21, 1961, four generals of the French colonial army in Algeria — Maurice Challe, Edmond Jouhaud, Raoul Salan, and André Zeller — attempted a coup against the President, Charles De Gaulle, who was negotiating Algerian independence with the Temporary Government of the Algerian Republic (GPRA). On April 23, a state of emergency was declared in France, and on April 26, the generals were arrested and the coup effectively failed. The state of emergency however remained operative to prevent other actions of this kind, as well as terrorist actions by the Organisation de l’Armée Secrète (OAS) in favor of French Algeria. Although this state of emergency that lasted until October 9, 1962 (one month after the Independence of Algeria) was not oriented against Algerians in essence, there can be little doubt that the extra executive powers it legally allowed has a lot to do with the way Papon acted in the second part of 1961. As mentioned above, one particular measure of exception taken by Papon consisted in a curfew specifically targeting Algerians on October 5, 1961. This measure motivated the FLN in France to organize massive demonstrations in Paris on October 17. All Algerian men were asked to join the demonstrations unarmed — any person found with even a knife risked being severely punished by the FLN — in the center of Paris that evening in order to form three corteges protesting the curfew in particular, and French colonialism in general. 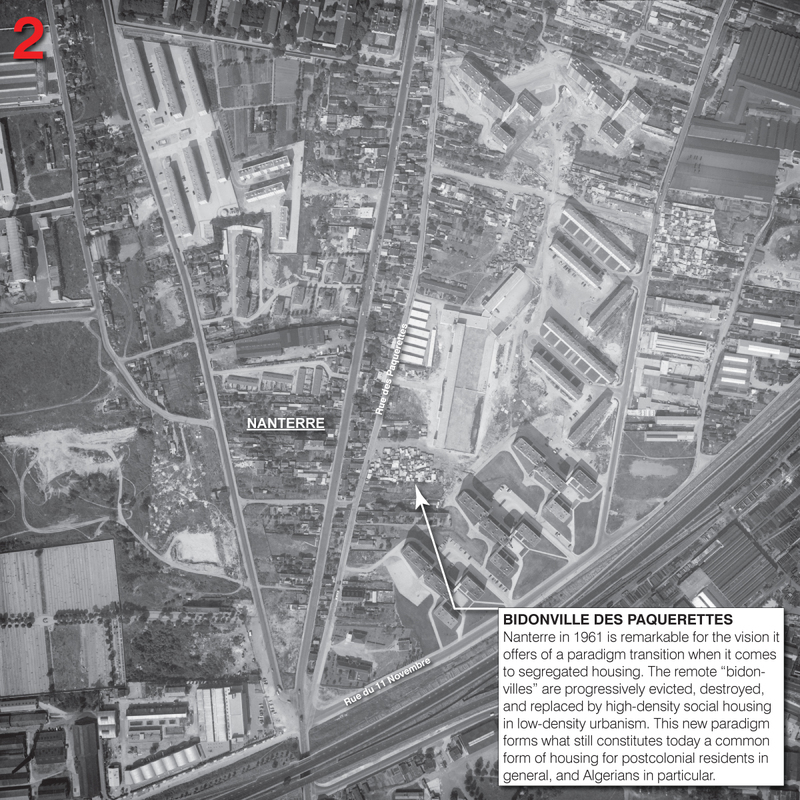 What the maps above attempt to demonstrate is the difficulty for Algerians living and working in Paris’s banlieues to access the center of the city in order to join these demonstrations — and here a broader point can be made about Paris’s segregating centrality still operative today as regularly discussed here. 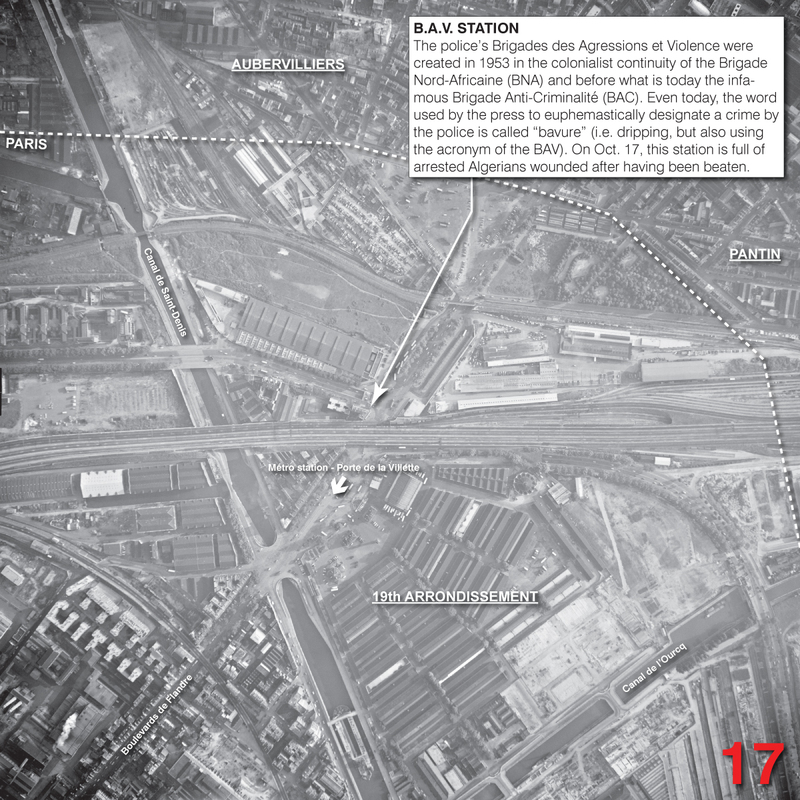 Bridges and subways stations are particular sites of violence, as their narrowness allows a tight and systematic control by the police (see maps 8, 9, 10, 11, and 12 below). 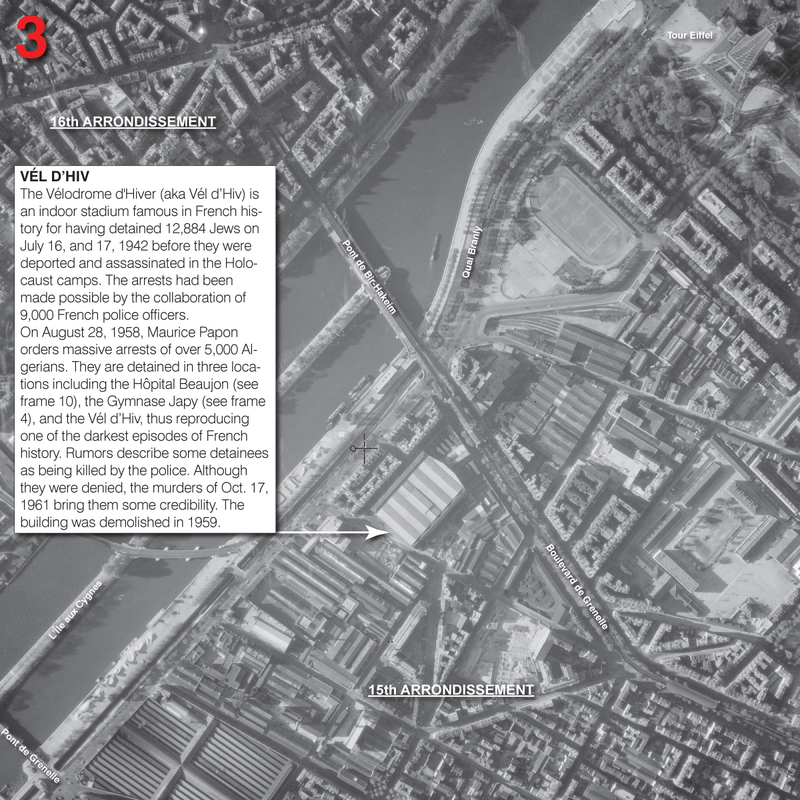 On many of them, Algerians were arrested, systematically beaten with batons, and even sometimes shot and thrown in the Seine (see maps below for more details). 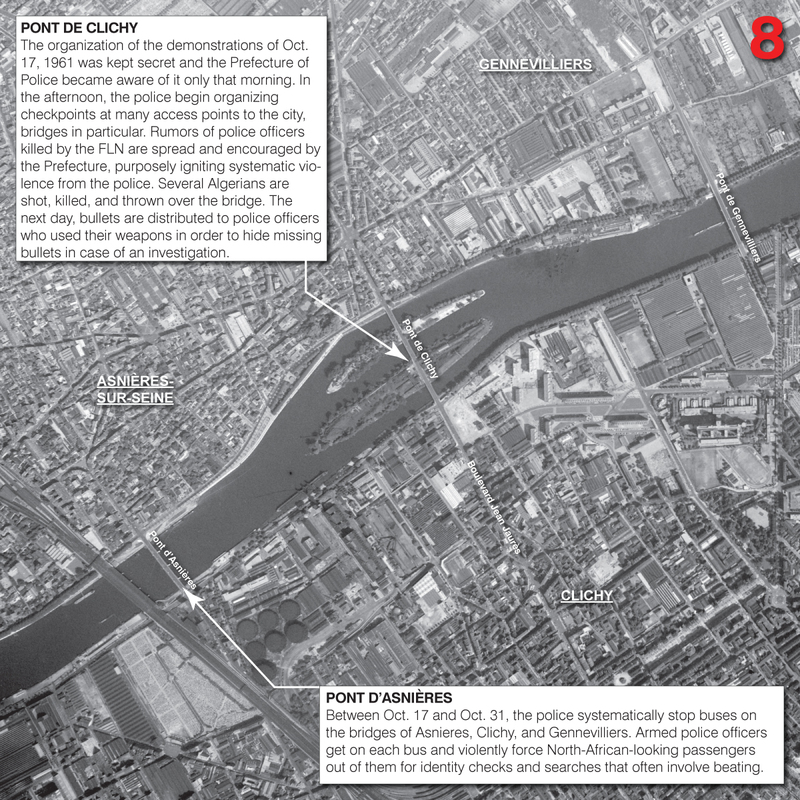 Although Papon is not thought to have given direct orders for the massacre, he was present in the command room of the Prefecture of Police, only meters away from the bloodbath of Saint-Michel (see map 12), and the lack of any order to prevent the violence and killings, as well as the false rumors on police radio that some officers had been killed by Algerians, makes him effectively the commander responsible for the massacre — something for which he will never be prosecuted. This is even truer when one looks beyond the “hot-blooded,” murderous suppression of the demonstrations. 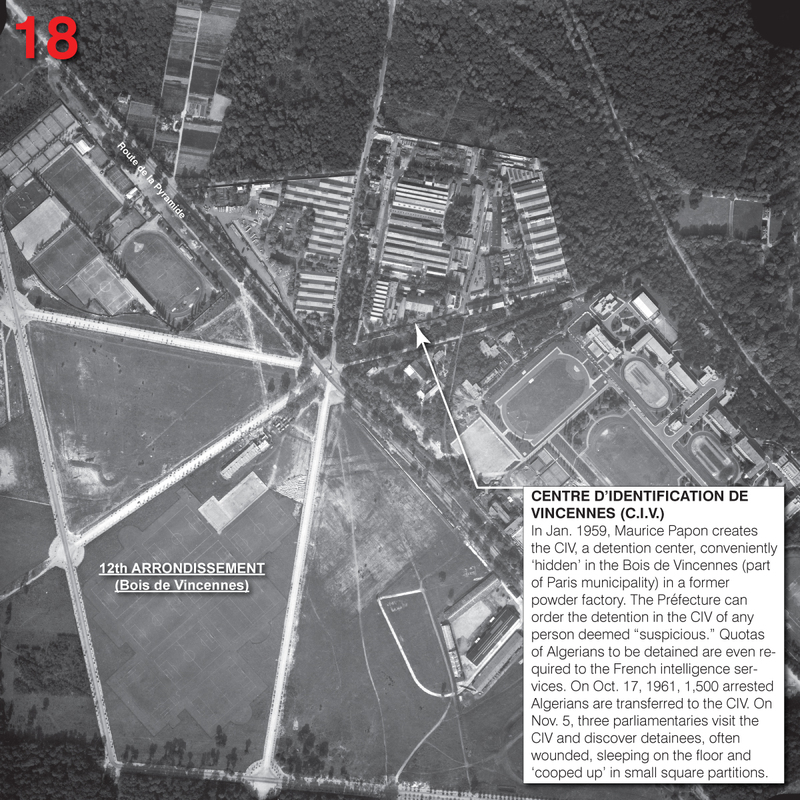 Later that night, and in the following days, systematic beatings and even killings continued in the improvised detention centers of various sizes — the largest of which being the indoor Stade de Coubertin (1,800 detained, see map 16), the Parc des Expositions (6,600 detained, see map 17), and the CIV itself (860 detained, see map 18) —and in the police operations on bridges at the gates of Paris (see map 19), and against the demonstrations of Algerian women and children organized by the FLN on October 20. 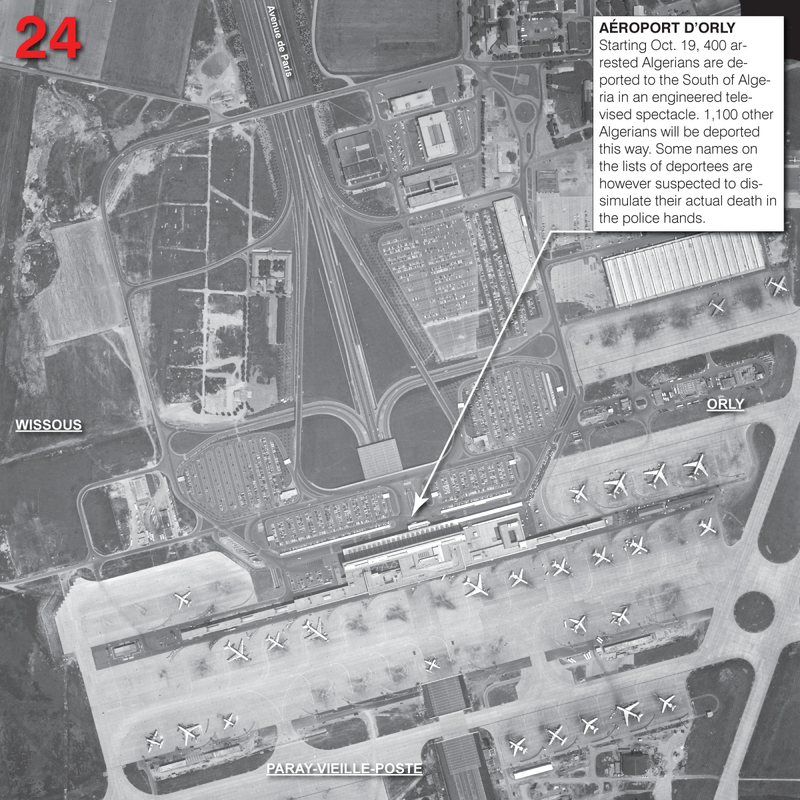 (see map 21). 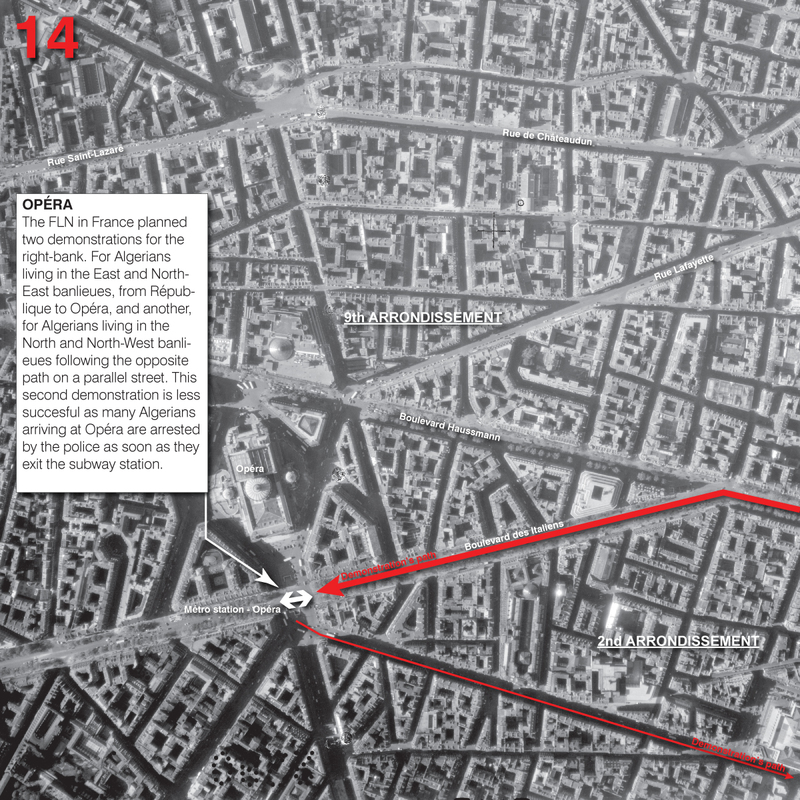 The number of Algerians killed or injured during this dreadful week of October 1961 are still unclear, in particular because of the way the Police archives have been manipulated to reflect a much lower number of casualties than reality — some people who had been killed were also on the list of people deported to Algeria — but it is estimated that between 200 to 300 Algerians were detained and/or shot to death, and that 70 to 84 additional people were killed after having been thrown into the Seine. These deaths took years to be acknowledged, in contrast to the nine victims of the February 8, 1962 massacre, killed by Papon’s police at the Charonne subway station during large demonstrations of French people against the OAS and the suppression of Algerians. These nine French people were members of the main worker union, the Confédération Générale du Travail (CGT) and of the Communist Party, and they were commemorated by 500,000 people in the streets of Paris four days later, thus contrasting with the absence of massive protest following the massacre of the Algerians. Finally, in 2001, a memorializing plaque was set up in Saint-Michel to commemorate the “memory of the numerous Algerians killed in the bloody suppression of the pacific demonstration of October 17, 1961.” As is often the case when it comes to the memorialization of colonial crimes in France, those responsible are not directly cited, making it a crime with no criminals, and as explained at the beginning of this article, such a narrative also significantly reduces the spatial and temporal scope of the massacre itself. For this reason, one might value more another official plaque set up in Saint-Denis (Paris banlieue) in 2007: “On October 17, 1961, during the Algerian War, thirty thousand Algerian men and women of the Paris region pacifically demonstrated against the curfew that was imposed on them. This movement was brutally suppressed on the order of the Prefect of Paris. Demonstrators were killed by bullets, hundreds of men and women were thrown into the Seine River and thousands were beaten and imprisoned. 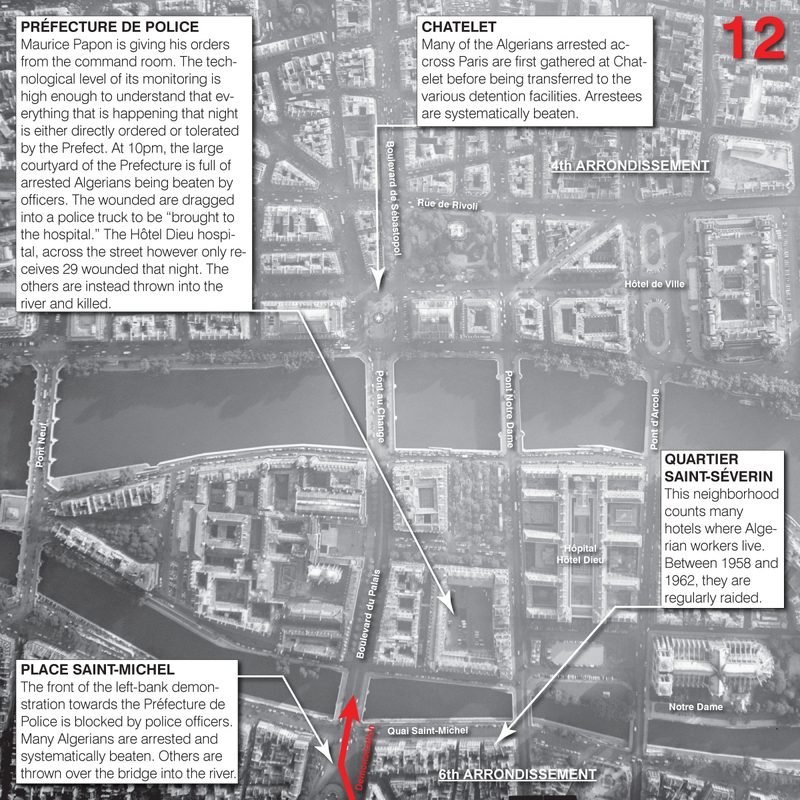 Dead bodies were found in the Canal Saint-Denis. Against racism and forgetting, for democracy and human rights, this plaque has been inaugurated by Mayor of Saint-Denis Didier Paillard on March 21, 2007.” Nevertheless, here again, the broader context of colonialism remains unspoken, illustrating once more that France has never fully engaged with the structurally racist and colonial violence of its past, let alone of its present, which operates in direct continuity with this violence. More than 27% of France’s current population was alive in 1961, and many actors in the October 17 massacre, Algerian demonstrators and French police officers, still carry its memory, its traumatic wounds (for the former) and its immunity to responsibility (for the latter). History often forgets to mention the way perpetrators and victims have to live together in societies indifferent to (if not in denial of) the violence behind the way their relation came to be. 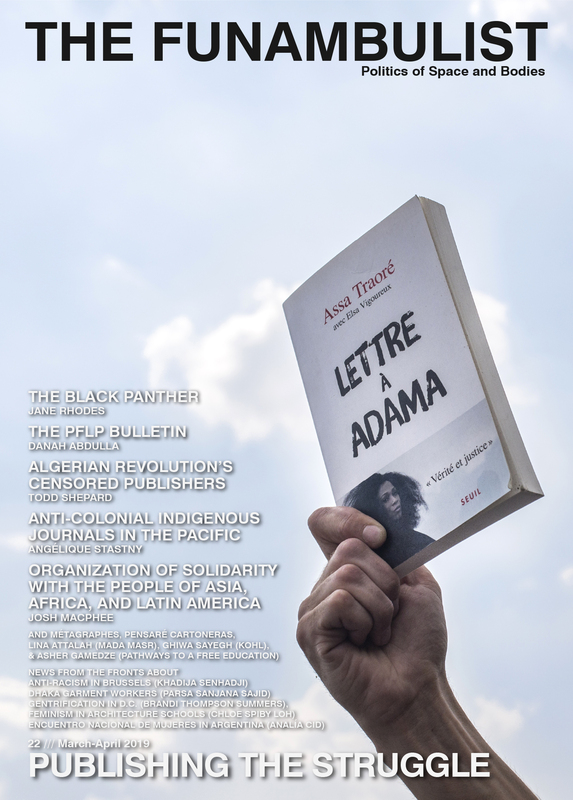 In this regard, the genealogy of this violence is not solely perpetuated through familial generations, but also through the racialization of French society ruled and controlled by an overwhelmingly white political class and police — the Brigade Anti-Criminalité (BAC) created in 1971 from the colonial logics of the BNA and the BAV, and particularly active in the banlieues, is the most blatant example — and, at the other end of the spectrum, racialized subjects whose lives are often territorially, socially, and economically segregated from their privileged counterparts. 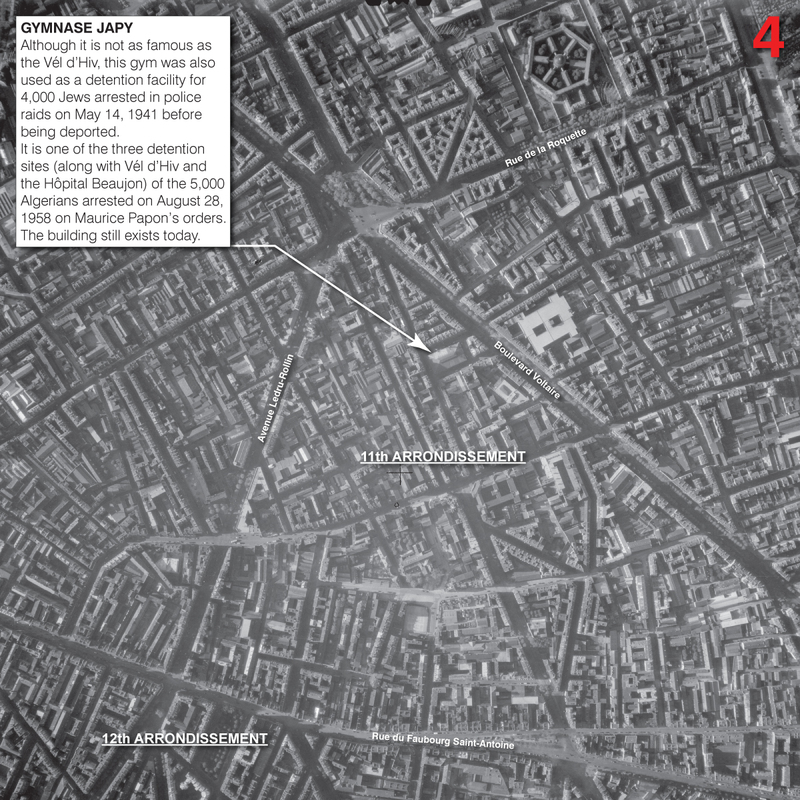 Paris being a city that has not structurally changed since the second part of the 19th century, the weaponized spatiality shown on the maps above and below remains fully operative today. – Jean-Luc Einaudi, La bataille de Paris, Seuil, 1991. — In 1999, Einaudi was sued by Papon for defamation. After presenting his extensive research to the court, he won his trial. 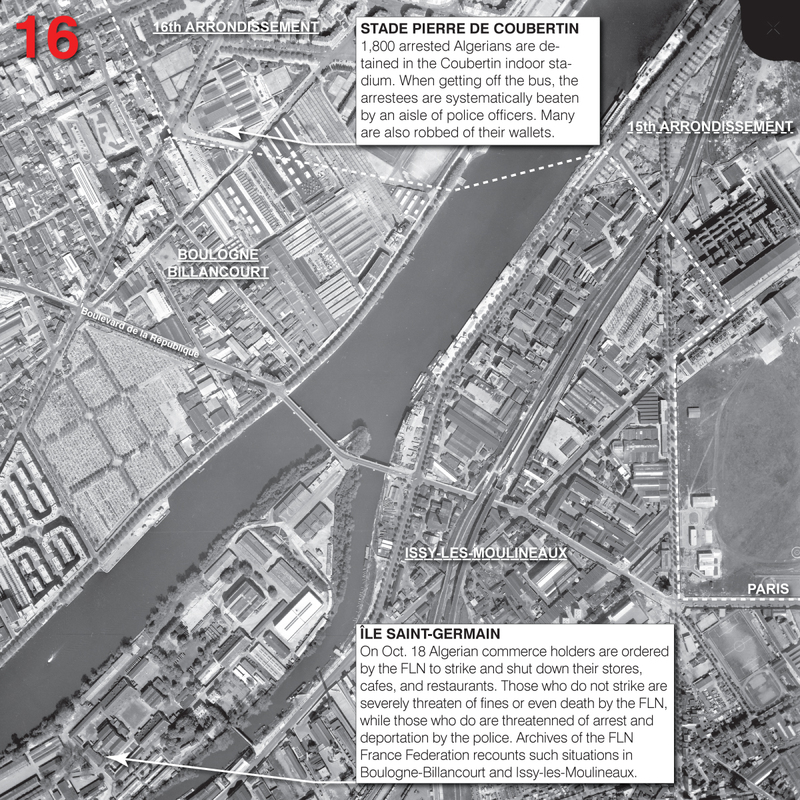 – Mathieu Rigouste, “The Colonial Genealogy of the French Police,” in The Funambulist 8 (Nov-Dec 2016) Police. Bidonville de La Folie as drawn by Laurent Maffre (2012). The indoor velodrom “Vel d’Hiv” during its regular sport function. Current view of the Gymnase Japy. Old photograph of the Pont de Neuilly. 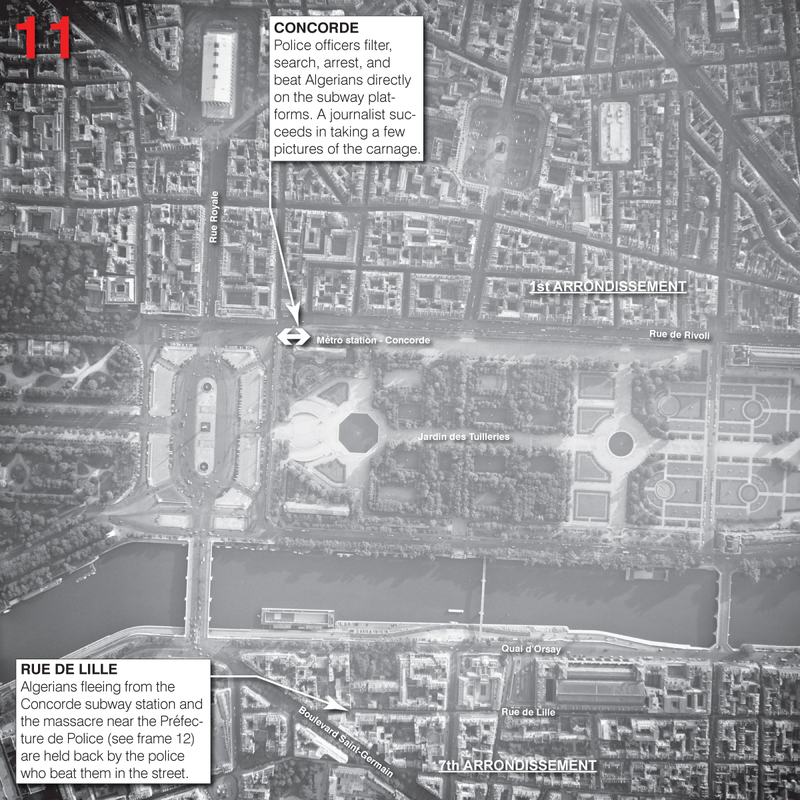 The Place de l’Etoile is situated half-way between Nanterre and the Prefecture de Police. Two of the few photos of the massacre that were taken that night. Photograph of the “right-bank” demonstration. Another photograph of the “right-bank” demonstration. Current police station at the Porte de la Villette. Current view of the still-existing Pierre de Coubertin stadium. Old photograph of the Palais des Sports where Ray Charles sang, while thousands of Algerians were detained in its irect vicinity. Archive photographs of Algerians detained in the CIV. Current view of the Pont d’Argenteuil. 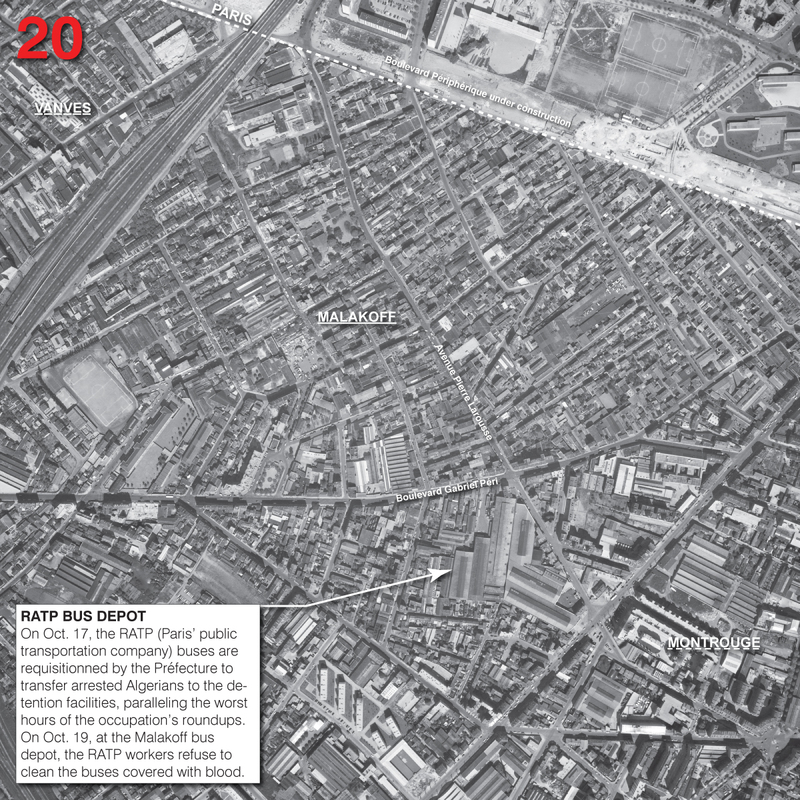 Most Algerians prisoners were transported to detention facilities by requisitioned public buses. Current view of the Hopital Sainte-Anne and its chapel. Current view of the Bassin de l’Arsenal. Photograph of the commemorative plaque set up in Saint-Denis. Arrested Algerians spectacularly deported to Algeria in front of journalists.